My previous post discussed a new method to “hide update” and stop a particular updates you don’t want from being installed. But what if you want to stop all driver updates, while keeping the security and defender patches flowing? To do this, just press Windows+X to open the Control Panel. In the search box, type device install. I don’t recommend this unless you have very specific needs or have specific problems that prevent you from accepting hardware driver updates. However, those that need this will know they need it. Set this to never get drivers or manufacturer updates automatically. That’s all there is to it. 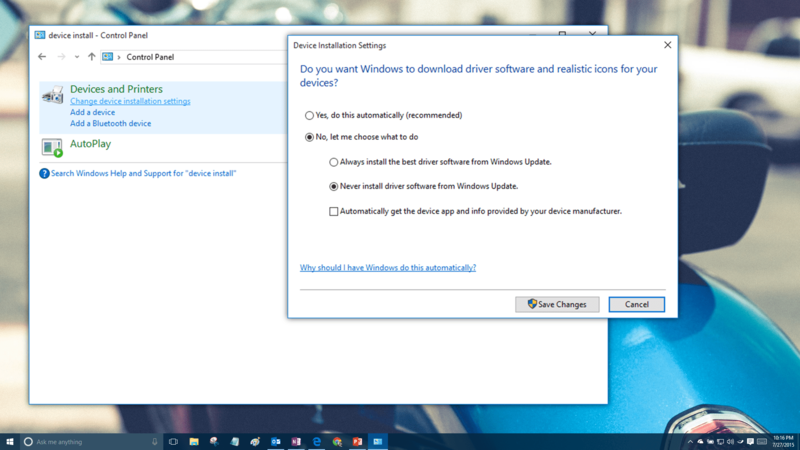 Now you’ll be responsible for installing your own drivers from the hardware manufacturer directly, keeping you in complete control.